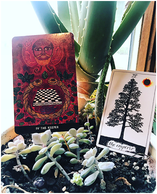 We are just leaving the arms of the Empress along our way through the Major Arcana, where we learned the capacity to hold creation and nurture its growth. We discovered abundance but also learn we cannot hoard it if we truly want to grow and prosper. We cannot have our experience if we stay in our mother’s embrace but we do need to come home to her and feel it from time to time. Of course the mother only feels safe letting her still foolish young magician, the one who is just learning to read the stars and hear the moon. Of course she can only give over this young traveler to the trusted hands of the father of the tarot, the Emperor. He still offers the nurture of a parent. The mother teaches with her abundant love, one that is always available with the soul is impoverished. But she knows we cannot overstay or else miss our chance to discover who we are. When we come to stand before the Emperor, it is time to understand our own authority in our lives. The Celtic Wisdom tarot knows the Emperor as the Keeper of Harmony and depicts the Teutatis, the Ruler of the People. It is a card of leadership. The sort that inspires confidence. The Ogham tree associated with this card is Bramble. And much like a good leader, Bramble thrives on any terrain and holds the space it occupies. In the Wild Unknown, the Emperor is a tree in shadow against the light of the sun. We no longer need to seek the light within, the Empress taught us how we can tap into that when we do. The Emperor asks us to see by the light of day and forge a clear vision of where we stand and how we wish to grow. As a father, he also teaches us the importance of leading in a way that is harmonious. The father knows his family is strongest when they work together. When the Emperor arrives at our door, he would like us to move confidently along our path. To move with purpose and to inspire others to do the same. His lesson is to trust your own authority in the situation or if we feel we may have be abusing or misusing it, then we must seek to remember its origin within us. When we own ourselves fully and honestly and trust in our own power, we will find a sureness of step that will have us ready to walk our walk through the world.